I already put up two regular Neerja reviews, one with spoilers and one without. But now it is time for a full summary. I don’t know if I will really be able to do it justice in a description, but I will do my best! I have to admit, I missed the first few minutes of the film. Because I took a nap and overslept and got to the theater late. Well, actually, because I was up late the night before watching Bahubaali, again. Anyway, I am pretty sure I didn’t miss anything huge? When I came in, it was intercutting between a neighborhood party and the anonymous room where our 4 hijackers are preparing. Pretty soon after I walked in, it cuts from the party back to her family returning to their apartment. There is a lot of little character background and personality touches in these scenes. She is called “laado” by her family, clearly the adored baby girl. Her mother nags her for staying up too late when she has to work tomorrow, and they tease each other about their mutual dance moves from the party. Her Dad is writing an article for his newspaper at the kitchen table and staying out of the mother-daughter back and forth, her brother is lounging on the sofa and starts teasing her when her ad comes on the TV. But more importantly, we see how they are generally navigating around each other as a group. And we can compare that with how our future hijackers are acting. In the Bhanot household, no one is perfectly in synch. 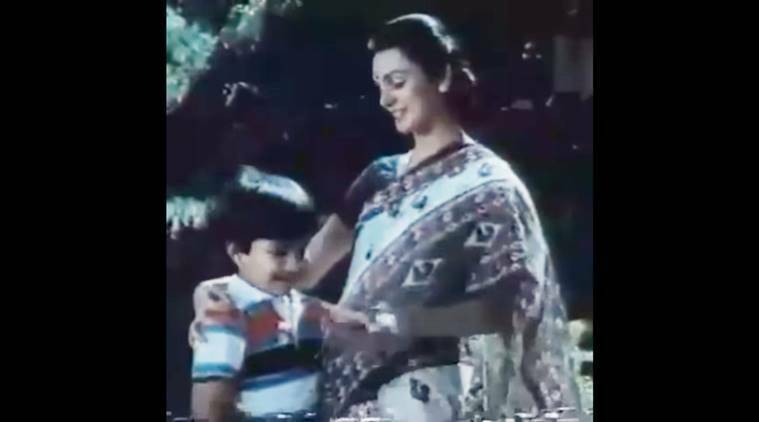 Dad is work, brother is watching TV, Mom is pushing Neerja towards bed, and Neerja is resisting. And yet, they all love each other. There is a warmth and comfort in how they move about each other and go from topic to topic and place to place, never landing in exactly the same spot at exactly the same time. And then we have our hijackers. They are, at this moment, aggressively in synch. They are doing the same thing and preparing for the same actions. They call each other brother, the hug and embrace before leaving. The parallel is set up, which environment is more supportive? Which group is ultimately closer? Which way of acting and being will give you the ultimate strength? And then it’s 1am and time to get Neerja ready for the airport. Her Mom goes in to wake her up. This was one of the moments that Shabana talked about in interviews. The director wanted something a little different, to show how close they are as mother and daughter. But he also wanted something that felt natural, that could believably be something they do every morning. So Shabana came up with something, at first patting her shoulder and, when that didn’t work, crawling into bed with her and holding her from behind. Shabana said she got the idea because it is how she wakes her own mother sometimes. She also said that Sonam didn’t know she would do it in advance, but just went with it. By the way, you will notice that I’m not following my usual policy and calling the character by the actor’s name. I usually do that for 2 reasons, both of which don’t apply here. First, that the characters usually have such neutral names (Raj, Puja, etc), so it is actually easier to follow the film if you just think of them by the actor’s names. In this case, Neerja is the title, the character, and the famous heroine. So it is pretty easy to remember who she is. Second, that the actors most of the time are just playing their public persona more than an actual character. That isn’t a slam at the regular acting style, in most films, it relies on them playing the star more than the character. But in this, Sonam actually does a phenomenal job disappearing into Neerja and losing Sonam entirely. I do wonder what all want into choosing her for this part. She is an experienced actress, certainly. And well known. And still young enough to convincingly play a 22 year old (Vidya Balan, for instance, could do this part in her sleep, but you would lose that little bit of a baby face which really makes it work). 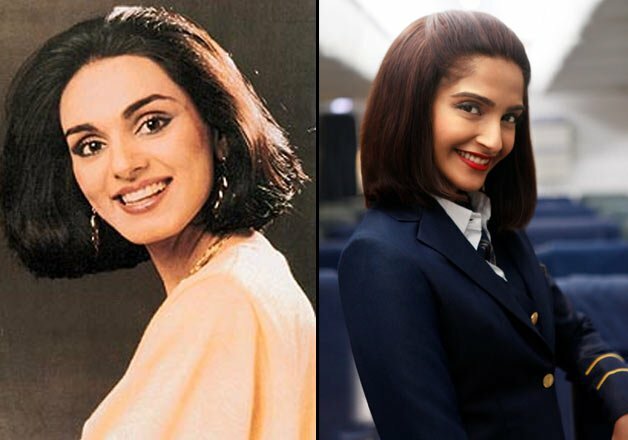 And she looks shockingly similar to the real Neerja. 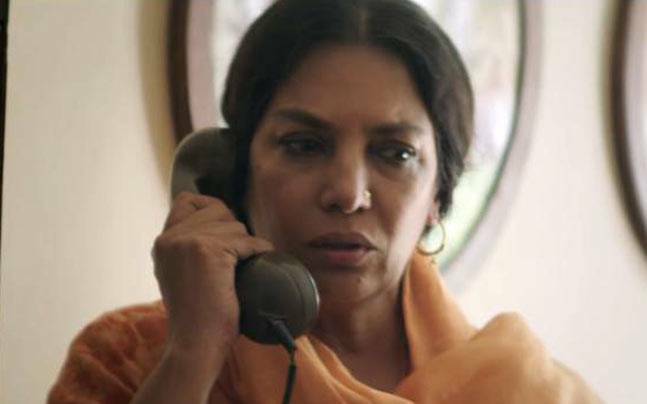 But it is just possible that her relationship with Shabana Azmi also played a part. I have never been able to track down exactly what the connection is, but there are close ties between the Anil Kapoor family and Shabana Azmi. It could be some sort of cousin relationship ages back, or just that they’ve always been friends, but at funerals and weddings and book launches and everything else, they are always there for each other, more in the family role than just work colleagues. Anyway, in the same interview where Shabana talked about this part of the film, surprising Sonam by cuddling her from behind, she explained that it was easy for her to be this physically comfortable, and easy for Sonam to respond to it, because she does know her so well, and she has watched her grow up, and playing mother and daughter wasn’t too far from the truth. And I kind of wonder if that built in relationship between these two actresses was part of the consideration in choosing them. If so, it was an excellent decision. Their comfort with each other shines through, and they also both gave amazing individual performances. This is the part I mentioned in my spoiler-review. I kind of thought that would be all we ever heard about Nahesh. That they would move forward treating her as just a simple and beloved girl, the doted on spoiled daughter we have seen so far. But that was just because I wasn’t paying enough attention. Even in these early scenes, where we just see her being the baby of the family, there were already little signs that she is not weak, just kind. She quietly pushes back in her own way, telling her mother that she loves her job and has to go to work, ending the discussion about the lost ring, making her own arrangements for a ride for a middle of the night trip to the airport, even staying later at the party than her mother wanted her to was a sign of her inner strength. It is masked because she is still a nice and caring person who wants everyone to be happy. So she doesn’t make the big angry pronouncements that we have come to think of as indicating a “strong” person. She just quietly does what she wants to do without hurting anyone else. Oh, and then car ride, and we get to see exactly what the deal is with Jaideep. They are so cute together! She is trying to fix a cassette tape as they drive, and he is teasing her for singing Rajesh Khanna songs. He calls her “babumoshai” and tries to do a quote from Anand, but butchers it, and she laughs at him. He also tells her that when she is away, he misses her voice the most. Even though it is terrible, he still loves to hear it. She yells at him to stop and look, and we see a huge poster of her in bridal clothes outside the car. For a moment, it seems like she is ignoring his sweet statement, because she doesn’t want to deal with it, or is too self-centered, and instead wants him to admire her poster. But no. She planned this, and had him take her this route. Because she knows he misses her, and when she is gone, she wants him to look at this poster so he misses her a little less. He laughs and teases her about how pretty she looks, is that even really her? They must have used so much make-up! And then they pull away and keep driving, and the love song starts up gently in the background while they talk and laugh. It is so sweet, and so perfect. He cares about her a lot, he is driving her to the airport at 1am. And he knows her well enough to tease her. And instead of getting angry at the teasing, she knows that it is coming from a place of love. More than that, it is coming from a place of respect. They are clearly still sort of feeling each other out. It doesn’t feel like a passionately in love couple that are filled with feelings and urges. It feels like two people who really really like each other, and are close to being completely in love, but are holding back a little. He makes a sappy statement, she responds by giving him a solution to his feelings without officially reciprocating them. And he backs off and teases her again. Just that little bit gives us a slightly different way to look at her other interactions, and a slightly different perspective on Neerja. She seems happy and hopeful and sweet and untouched by life with her parents and with her boyfriend. But when she walks away from the people who care about her, suddenly she is free to show her sadness. She is an expert at playing the role that is expected of her, of being the daughter and girlfriend that her loved ones want her to be. But that is not necessarily who she feels on the inside. And really, the only people she was fooling were us in the audience who have just met her. Her parent seem too doting, too careful, but it is just because they know she is hurting on the inside. And her boyfriend retreats to teasing and jokes not because he isn’t ready to admit how he feels, but because he knows she isn’t quite ready for it yet, no matter how carefree and confident she appears. And again, if this was all we got of the damage from her marriage, I would have been fine with that. It’s made her a little more fragile, a little stronger, and a little better at covering her feelings. To put in more is not for character reasons, or for plot. It is because this is how the filmmakers see her, that for them the marriage was a defining moment. Which will play out through out the rest of the film. Meanwhile, we are also seeing the hijackers moving closer to the airport as well. And their dynamic is beginning to be apparent. For one thing, there is only one terrorist whose name we really learn, Khalil, the youngest. Just like, in my Sunday School class, I really really know the name of that one little boy who is constantly standing on his head or jumping up and down or hitting people, because I have to keep yelling at him and getting his attention. Khalil, the youngest hijacker, has a hard time getting his gun loaded, getting his fake uniform on, dealing with the gate guard, everything, and they have to keep yelling at him about it. There are two other hijackers with him, the calmer more experienced one, who seems to be in charge, and another younger one, who is confident and cocky and impatient with Khalil. At one moment, briefly, they come to blows when Khalil has a hard time loading his gun and the other young hijacker tries to take the gun away from him. The older leader has to come between them and remind them that they are all trying to do the same thing and working together. As I mentioned in my first, spoiler-free, review, this feels like a statement about a world without women. There is no one to smooth things over, to worry about feelings and relationships and all that stuff. Instead, you have 3 guys who think just having a goal in common will be enough to hold everything together. Meanwhile, Neerja and her friends are all about feelings and relationships and caring for people. We see them greet the passengers, a nice old lady with her grandson, who immediately says “You girls are so pretty. Have you met my grandson? He’s a doctor and doesn’t have a wife!” There is a nice couple named “Goldstein” who ask Neerja if she is the woman on the cover of their magazine, she says yes. There are the pilots, one Indian, one French, and one American. The French one teases Neerja since she is trying to learn French, but still hasn’t. The American is a little stiff and awkward but takes her list of passengers. And finally, she goes back down to the regular seats where another attendant stops her and has her go speak to the 3 unaccompanied minors who are traveling on the flight. And then the attendants take their seats, and the lame American pilot makes an announcement, trying out his Hindi, at which everyone smiles indulgently. As soon as they are seated, Neerja’s friend starts to tease her about the letter Jaideep gave her, to try to get her to read it early. Again, Neerja is trying to make everybody happy. She is worried about the passenger sitting opposite them, who is listening in on their conversation, she keeps glancing and smiling at him so he feels more comfortable, and at the same time she is trying to say “no” to her friend without being mean about it, and mostly she is trying to keep her promise to Jaideep not to open the letter until her actual birthday. But this whole conversation, which ends when she convinces her friend to give the letter back to her unread, so long as she promises to tell her what it says, makes her start remembering her marriage. And, flashback! The chyron on the screen identifies this as a year early in the Middle East (I missed the exact country). She looks different, longer hair, down, in a salwar with a scarf on her head. Instead of the perky red lipstick and mascara in the present day scenes, she has modest eye-liner and no painted fingernails. She is in a really tiny kitchen, trying to move around and open take-out packages, with a guy standing near her, sort of taking up all the space. It is her husband, Nahesh. He is complaining about how she doesn’t know how to cook, he has to spend this money on take-out. She is trying to move, opening packages, getting things ready, saying she will learn. Her husband starts to talk about how much it costs, getting food every night, because her parents never taught her to cook, because she was their little princess, they spoiled her, and now he is stuck with her. The whole time, their body language is telling half the story. She is crouching a little, trying to make herself small, but the whole time you can feel that it is unnatural for her. She is still fighting back a little, saying that she will learn, she is sorry, she will clean the kitchen. She isn’t denying or disagreeing with anything he is saying, but she is still trying to make it better, to respond in a way that will make him be nicer to her. In a few more years, she would just be standing there silently taking it and waiting for him to leave, but now it is clearly new enough that she thinks she can fix it, that she can find a way back to what she used to be. You can see that the real fight is within herself as she has to force herself to be nice, to keep up the facade that things can get better, when she is really disgusted by this man. It’s all in the last ten seconds of the scene. She has put the food on a tray and starts to take it out to his friends. He stops her, tells her she has to stay in the kitchen and clean up, and then leaves. And as he leaves, he puts his facade back on, cheerily calling out to his friends that dinner is ready. And she drops her facade, holding the chewed chicken bone he handed her, and looking equally disgusted by the bone in her hand and the man she has married. I think the flashback continues at this point (although it is possible I am mis-remembering and this bit is shown later) and we see her, still dressed traditionally, standing in a marketplace, using a public phone to talk to her father. He tells her she has to make it work, they’ve only been married a little bit, just try. And he reminds her of what he’s apparently been telling her all her life, that if you do the right thing and be strong, you will always win. And he ends by telling her she is his brave daughter. And making her repeat that she will remember this. And then we come back to the present, she is back on the plane, and they are landing. There is some re-adjustment in their seats by the passengers, the pilot makes an announcement that they will be taking off again soon, and Neerja goes to greet the radio engineer who is coming on to double-check their equipment. They have some back and forth about whether she brought “it” and she hands him a blue plastic bag. He opens it and glances inside and says “Oh, Rajesh Khanna again! You know everyone wants Amitabh.” She ignores this complaint, like a good fan, and sends him up to check the radios. Meanwhile, the hijackers have reached the airport. They manage to talk their way through the gate, and finally spot the plane on the tarmac. They pile out of their jeep and start running to the plane. Neerja’s friend is closing the door and sees them coming. She tries to close the door, meanwhile the hijackers shoot the workers on the wings refueling the plane and run for the stairs. The door is almost closed, and it’s amazingly well done, you want to shout at her “close the door close the door!” You can feel the moment of safety so close! But of course she doesn’t quite manage it. Because otherwise we wouldn’t be watching a movie about this today. There had already been about a dozen hijacking incidents in the 1980s before Neerja’s plane was taken. Most of these incidents ended peacefully. The hijackers were open to negotiation and just wanted the pilots to fly them somewhere. But it was still a stressful and terrifying thing, sometimes passengers were killed or caught in the crossfire, and the standoffs could last for days. Today, when we think hijacking, we immediately think “terrorists”, some sort of suicide death pact situation. But that is just because increased security means it is now something that only happens if people really really want to do it, not just as part of a clever plan to get out of the country. What that means is, as far as Neerja and her fellow passengers knew, this was a terrifying and horrible situation, but more along the lines of being caught as a hostage in the middle of a bank robbery. It didn’t necessarily have to end in tragedy. When the hijackers first burst in, there is a moment of confusion. The flight attendant at the door is flung back, the passangers scream. Neerja is on the other side of the central aisle from the hijackers an goes for the phone intercom. Her hand is shaking, and so is her voice, but she manages to say “hijack” into the phone. On the other end of the line, the pilot is listening and doesn’t understand until she says it again. And then the pilots have an interesting conversation. The two co-pilots are for staying, because they have a responsibility to the passengars. The head pilot, the American, argues that regulations are there for a reason and they should follow procedure and leave the plane. Meanwhile, since Neerja had to go for the phone, she is the only attendant left near the door and the hijackers grab her and force her to take them up to the cockpit. They pass the nice couple who asked her about the magazine on the way and chase them back down into economy class with everyone else. Downstairs, all the passengers are being combined into one small area. They make her knock on the door to the cockpit, when she tells them that it only opens on the inside, and try to get the pilots to open. When no one answers, they finally shoot the door open and burst in. Only to see the emergency trap door in the roof open, and the 3 pilots sprinting across the tarmac. The hijacker climbs through the door and shoots at them, but doesn’t hit them. This is one of those moments that both Rishi Kapoor on his twitter feed and my friend who was sitting next to me in the theater found unbelievable. That the pilots would be so cowardly as to leave, and that the hijacker couldn’t even manage to hit them. But, of course, we have to believe it. Because it is what really happened. And I think it is interesting that this is what really happened. In my first review, I talked about how Neerja shows the stories of women, women who have to stick around and take care of people while men do the big heroic actions. The pilots left because that was the policy for hijackings. The pilots were too valuable, too important and powerful, to risk being captured, so they ran away. The purser and flight attendants are disposable, they don’t do “important” work, so they are supposed to stay and take the risks. Of course, again, this is with the assumption that most hijackers are just looking for money or an escape route and can be convinced to peaceably leave through negotiation. And it was probably also assumed that since the main goal was a free flight, having no pilots available would make them give up sooner (one of the earlier hijackings had lasted for days and days, taking the plane from Austria to Geneva to Sicily to Damascus, before landing in Tehran at which time negotiations continued for another 3 days). But all of this becomes gendered, because of course men will be pilots and women will be flight attendants. So the “brave” men get to run away and protect their power from falling into the hands of the hijackers, while the “weak” women get to stay back because they are less important. In the same way, it is “unbelievable” that a hijacker with all the power of a gun and his manly violence in hand could fail to hit the running figures, could be that incompetent. It’s just not what we’re used to seeing in a movie. But in real life, the people taking the active manly role mess up constantly. And the ones who take the passive womanly role constantly succeed by just following basic procedures and simple precautions, like using the phone to warn the pilots of a hijack. Downstairs, the hijackers are furious and frustrated. The passengers are screaming and hard to control. One of them wants to make an announcement and grabs Neerja’s friend to make it. And this is the first moment that Neerja steps up and takes control, stopping him and saying no, she is the head purser, she will make the announcements, and sending her friend to go sit down. It’s clearly a hard thing for her to do, but she does it almost automatically, like her brain isn’t really processing anything beyond “it’s my job to make announcements, even if I don’t want to, so my friend should be able to go sit down.” It’s while making the announcement that the real shift occurs. They just want everyone to sit down and be quiet. She changes their orders to “be calm, and this will all be over soon.” She also tells them to put their hands down. At this point, again, she is almost automatically saying what needs to be said to make the passengers more at ease, she isn’t consciously going against the hijackers. But when they see the hands going down, they yell at everyone to keep them up, and Neerja turns to explain herself and make them feel more comfortable as well. To make everything easier for everybody, just like moments earlier when she was torn between her promise to her boyfriend, her friend’s teasing, and the passenger watching them. It is the same instinct and skills. And she does convince them, that if they let the passengers lower their arms and let her keep them calm, this will all be over sooner. Meanwhile, back in the airport, the pilots have finally reached the headquarters and are yelling at the chief of security that their plane has been hijacked, and there are almost 300 passengers on board. And back home in India, Neerja’s nice old Dad is in his office, typing away, when his co-worker comes in and sort of awkwardly says that they have gotten word on the wires of a hijacking of a Pan-Am flight in Karachi, wasn’t Neerja working today? Her Dad agrees, and takes the piece of paper, and looks down at it, and looks just sort of puzzled by what he is seeing, saying the flight number is 73, but that can’t be right. His co-worker agrees, and says they will call their correspondent in Karachi and get full details. And this is another scene where I start to cry. It’s funny, I was thinking my biggest emotion would be fear, since I would be identifying so strongly with the heroine of the film. But actually, while that is there, it feels very much like you are watching this all unfold through her parents eyes. Not that they are so much part of the film, but like this is the version of the story her parents imagine, this is how they see their little girl and how they know she would feel and act. Which makes sense, since her mother and big brothers were highly involved in the film (her father died a few years back). And the most touching parts of the film turn into the ones where her parents are slowly realizing what is happening. As for instance, this scene. It doesn’t play like straight-forward denial. It plays like a father who took such care of his daughter in every way her whole life, who carries her so closely in his heart at all times and prays for her safety in every moment, that to think of something bad happening to her would mean that there is no meaning in the world. It would be same as someone telling you that you should walk on her hands instead of your feet. It’s just not possible, not unless everything you have always thought is no longer true. On the plane, the terrorists want to talk to the tower. They force Neerja to make another announcement, pulling her up as the person who volunteered to do it before. Her little rote decisions are already setting her up as one of the central characters in this conflict. They ask her to announce that if there is any radio engineer on the plane, they need him to come forward. As she makes the announcement, she sees the radio engineer who came on earlier, the one she gave the Rajesh Khanna tapes, sitting in the seats, with his jacket off so no one can tell he is an airport employee. He starts to stand and she very quietly flicks her eyes until he sits back down. For the first time, she is doing something that’s not strictly in the rule book. It is a small move, but it is something that will snowball and get bigger and bigger as she makes decision after decision for other people, trying to think through what will be the best for them all. Back in the airport office, the security chief is talking with his subordinate who has brought in a list of passengers. He tells him first thing that 44 of the passengers are Pakistani. The security chief says “What does it matter? Should we ask to see their passports before we save them?” And he says it in an exasperated way, like he can’t believe his subordinate even said such a thing to him to begin with, because it obviously doesn’t matter. This is a thing we were wondering about on the way to the movie theater! How the Pakistani government and characters would be handled. Because it all took place in Karachi, so everyone involved in the military and administrative parts were Pakistani. I was especially curious, because Sonam and others issued statements about how sad they were that the film wasn’t going to play in Pakistan, and how they hoped that after it came out the government would reverse their decision not to allow it in. On the one hand, I am sure dealing with the Pakistani officials in an even-handed manner would make the film more acceptable abroad and lead to a bigger box office. But on the other hand, it felt like they were sincerely upset about this. And seeing this scene, and several others, I can see why. They bent over backward to show how everyone involved was just doing their best and trying to be fair and help as they could. This really is a film that should play in Pakistan, so the Pakistanis can get the acclaim and credit that is their due just like the Indian characters are. Back on the plane, the terrorists hear the airport personal talking to them through megaphones on the tarmac. They are arguing with each other over what to do, now that the pilots are gone, while Neerja sits and looks through the window at the body of the grounds crewman. In the background, the doctor who came on the flight with his grandmother is trying to talk to them, telling them not to hurt him, trying to bend over his grandmother to protect her as well. He happens to be sitting in the front row, so the gun keeps swinging in his direction, and he keeps crying out that he is an American, not an Indian! Again, this is a thing that really happened. And again, it only makes sense if you get in the mindset of the passenger at the time. There had been several hijackings by Sikh extremists, at least one by a group protesting against the Pakistani government’s imprisonment of radicals, and almost no hijackings (at this time) by anti-American groups. And this was a flight from Bombay to Frankfurt with a stopover in Karachi. It would make sense that he would think protesting his American citizenship was the safest move. All assumptions would point to the hijackers being anti-Indian or anti-Pakistani, not American. (Of course, he was wrong. These hijackers were looking for Americans.) The head hijacker grabs him and drags him over to the door and opens it, so the security on the tarmac can see the gun to his head. Neerja tries to interfere and they grab her also and push her down next to him. The whole time, his grandmother is screaming, clawing at them, and shouting “Kill me! Take me! Kill me!” They finally have to almost throw her back into the seats to get her off them. And they yell out to the tarmac that they want a pilot within 30 minutes or they will shoot a passenger or an attendant. Back in the airport office, the Pakistan security chief is talking with a representative from Pan-Am, begging for a pilot to come forward so they can end this. The Pan-Am rep is telling him that they can’t do it, that it is against company policy. The security chief is begging, saying they are saving their pilots, but aren’t the flight attendants employees also? Which, yeah! That whole gendered thing I was talking about before, the myth is that women’s lives are valued more, but in reality, the people in “female” type jobs are considered expendable, in comparison with the “important” male jobs, like pilots. The same thing is going on in the plane, the hijackers automatically take the man as a hostage, not his grandmother. And the man thinks he has to protect her, when in fact she is much more willing and able to throw herself in front of death to protect him. Back in India, Neerja’s Dad has finally picked up the phone to call home. Her Mom is cleaning the house, digging through her room, and finds the ring she was asking about that morning. She holds it in her hand and there is a moment when you can see she is thinking that something might be wrong. But she shakes it off, and the phone rings. Her Dad is on the other end, and he speaks slowly and hesitantly, again like it is so unbelievable it is hard to even say. Back home, her mother just can’t believe it. She says the same thing he does, that it can’t be Neerja’s flight. When she is convinced it is, she says over and over “it will be fine” and he repeats back “yes, it will be fine.” Only it feels like they are only saying that because to say anything else, to acknowledge that it may not be fine, that something could actually happen to their daughter, would mean that there would be no reason to keep on breathing. Only it isn’t fine. Their daughter is kneeling on the floor with a gun to her head. We cut immediately from them, to this image. And the impact is not “she needs her parents strength to get through this!” but rather “her parents’ hearts would stop if they knew this was happening.” Again, it’s subtle, but it feels like we are being drawn into the parental view more than the heroine’s. The 30 minutes are up and the hijackers are yelling at the security official on the tarmac, asking where the pilot is. The security guy is doing his best, saying they are working on it, it is taking a while, please give them a little longer. By the hijacker is getting more and more exited, gun swinging between Neerja and the American. The grandmother is screaming again “Kill me! Kill me! Leave him! Kill me!” And then gun goes off, and we see the blood spatter on Neerja’s face. The grandmother falls to the ground, the hijacker kicks the body out the door and closes it, and Neerja stands and stumbles to the bathroom. At that moment, you can see that she has no room for anything else in her head than wiping the blood off her face. She is too shocked to worry about the hijackers shooting her for moving or anything else. And it works out, because she moves so suddenly, and they are distracted by the screaming passengers, so she is able to get into the bathroom and close the door. And, flashback! To her bathroom in her marriage. Another claustrophobically small room, just like the kitchen or the airplane bathroom she is in now. She has the long hair and is wearing the traditional clothes and minimal make-up again. She stares at herself in the mirror while her father’s voice echoes saying she is his brave daughter. And outside the door, her husband pounds on it, asking when she will be out, saying a pretty face won’t pay the bills, that he is going to write her father how lazy she is, how worthless, how he needs more money for her upkeep. How she needs to call her father and say she is not going home for the visit as planned, that they can’t afford for her to travel, that she made that decision with him. And she splashes water on her face and looks at herself in the mirror, and then turns to open the door. And the pounding fades out from the past to be replaced by pounding in the present as the hijackers yell at her to come out. This is the pounding that underlies the trailer. At the time, I thought it would be over the scene where she hides the passports (according to wikipedia, she threw some in a rubbish bin). That would be her pivotal act of bravery that drives everything. But no, the bravery happened long before she got on the plane, when she left the bathroom and confronted her husband months earlier. And this is the moment she becomes a hero, when she walks out of the room and takes charge of her life again, both now and in the past. No more accidental barely thought through heroism, it is all on purpose from here on out with full awareness of the consequences. She opens the door and goes straight into the kitchen area, ignoring the hijacker who is yelling at her, and filling cops with water and putting them on a tray. She quietly calls out to her co-workers, asking them to get trays, because it is time to distribute water. The co-workers are terrified, but come forward, because she is quietly commanding. The hijacker tries to stop her, and she doesn’t argue, she just says that the passengers are thirsty, and they are going to distribute water. And he backs down, merely telling her to do it fast. She walks over to the grandmother first, hands her the water, lifts her back on her seat, and helps her drink. And that is the freeze-frame that takes us into the intermission. The birth of Neerja: the Hero of Pan Am 73. This entry was posted in Uncategorized and tagged Neerja, Scene By Scene Indexes, Sonam, Spoilers, Summary, Uncategorized by mredlich21. Bookmark the permalink. The part you missed at the very beginning is a conversation she has with a rickshaw driver about just coming from seeing Anand for the 7th time “in the theater!” She talks about what a fan she is, and then when she arrives at the party, her brothers ask why she is late because it’s so boring without her. Immediately upon greeting her family, she takes the microphone, and organizes the children to sing a Rajesh Khanna song. So what is established is that she is the life of both her family and her neighborhood. And that she has incredible rapport with children, and that she is confident about taking control of a situation quickly. Those are points repeated later, but it was a nice setup. Thanks! If it were any other movie, I would have stayed for the second show just to watch the opening. But for this one, once it was over, I was just so emotionally drained that there was no way I was staying. Maybe, if it is available streaming at some point, I will try to get through the first 5 minutes just to complete it. Also, I was wondering why they didn’t really reference Anand. Because it is the obvious Rajesh Khanna comparison film. But if the whole thing opens with a big reference, that would explain why they didn’t bother bringing it up again. OK, I’m only about a third of the way into your summary, but I must stop and correct one major, major error/flaw in your understanding of what happened. You say the pilots escaped because they are considered “too important” to risk. That wasn’t it at all. However much you tried to make the hijackings of the 70’s and 80’s seem benign in comparison to today’s terrorism, they actually were quite terrifying, and many hijackers had mal intentions. The usual procedure was for the hijackers to gain access to the cockpit, thus getting control over the pilots, and then force them to fly the plane to wherever. Sometimes, because the hijackers hadn’t thought things through or planned very well, they would land in a country whose government refused to give them safe passage, or even to allow them into their country, and so they would be off again. Sometimes they would fly to three or four different countries (often way off the original flight plans, so that the plane would require refueling, which was grudgingly allowed, but sometimes not, in the intermediate countries). With the pilots being beyond the point of exhaustion by all these shenanigans, the risk of crashing and killing all the passengers was very great, in addition to any risk posed by the hijackers themselves. It was in response to these risks that Pan Am developed the policy of immobilizing the plane by having all the pilots escape from the plane, so that the hijackers would be stuck in the country they boarded the plane in. This flight was actually the first time that policy was implemented. I’m surprised Rishi Kapoor didn’t know this, but maybe he never read newspapers back then. In any case, the policy was criticized in the U.S. when it was first proposed, but especially after the disastrous results of this hijacking. It flew in the face of all western tradition of the “captain going down with the ship” (as the captain of the Titanic did), and was felt to be a betrayal of the passengers. But there was never any thought of the relative value of life of different flight crew or passengers. Also, I read a few more sentences further on, and must again correct you that most hijackers were only looking for a free ride out of their country. NO and NO!! Early in the 70’s hijacking became a big political tool for Palestinians, and they constantly used hijacking to get a platform to get their views aired in public. They got attention because they would be holding the pilots hostage, and threatening to kill them (or the passengers). There’s quite a famous photo of a Pam Am pilot with a hijacker sitting next to him and holding a gun to his (the pilot’s) head while he made his political demands. Pan Am in particular suffered a lot of hijackings, I suppose because at that time they truly were a global air line, flying the most international routes. Oy, vey, Margaret, you really need to check your history! There were no hijackings that were anti-American? Girl, almost all the hijackings were against the U.S. (for supporting Israel). That’s why Pan Am was targeted so much, for being an American airline. In the entire history of flight, there were only 6 hijackings by Palestinians. While they may have gotten the most publicity at the time, there were many many hijackings that were by other political groups (for instance, 2 separate hijackings by Sikh separatists, 1 by a supporter of Indira Gandhi, and another by Kashmiri separatists), or simply by criminals looking for an escape route, or to negotiate for a ransom. Most of the hijackings ended peacefully with no casualties. And most of the Palestinian hijackings were against non-American flights in non-American countries (Lufthansa, EgyptAir, Air France, etc.). Pan Am has only had 2 hijackings, this one and one in 1968 when the hijackers forced the flight to divert to Cuba, and there were no casualties. And yes, almost none of the hijackings were anti-American (at this time). This is of course my interpretation of all the facts available in that article, just as the blog post includes my interpretation of the facts. There is too much information to list out in detail, so I used my judgement as to how to summarize it and what conclusions to draw. We can disagree on the interpretations, but it is a fact that there were only a few Palestinian hijackings, and only a two of Pan Am flights, and most of the hijackings were non-fatal. I mean “too important” in that they have too much power and influence on the situation through their skills and abilities, not that they are VIPs or something. What is interesting is that the kinds of positions which have that level of power and influence are usually held by men, that’s where the gendered element comes in. Yup, it’s from my memory of the time. Wikipedia is a wonderful resource, but it is not completely authoritative, is it? Sometimes they have errors or omissions. I also think, being the age you are (i.e., not having been born at the time), you are not fully appreciating the context of the times. Which is to say, you are conflating events of differing significance. You mention, for instance, a “hijacking” by supporters of Indira Gandhi to get her out of jail — since she was only in jail for an hour or two, if that, this had me completely flummoxed. Moreover, they used toy guns, according to you (from the article), so this is clearly one of those frivolous hijackings, which I don’t count among the serious ones. Yes, there were some “copycat” type of hijackings by people looking for a thrill, many of which were aborted fairly quickly by the authorities. Again, I don’t count those, because they basically made no impact on the world. But if you include all those types of hijackings in a total numeric count, it can make the others look minor or low frequency in comparison. It is as if one were to lump all traffic citations, say, to come up with a number that the police issue, say, 1000 citations in a year, the vast majority of which are not important. Maybe not. But you can’t really equate the tickets for jaywalking and expired parking, or even “fix-it” type of tickets, with those for DUI, can you? They have completely different impact on society. The hijackings by the PLO (they had just started then) had a huge impact in terms of drawing the world’s attention to the Palestinians’ issues, getting them a platform, and eventually, a voice and representation in international organizations, and even turned around the foreign policies of several European countries (though that was aided by the oil embargo by OPEC nations, too). Having said that, it’s always interesting to me to see how events that I lived through are presented in “history.” Time and distance lend perspective, certainly, and can even bring out facts not known at the time, while people’s memories, even when accurate, are necessarily subjective — that is to say, it is a memory of one person’s experience, and not everyone’s. So that would argue that one must accept the historian’s interpretation over an individual’s. On the other hand, official “history” is agenda-driven, and many important events were only preserved and ultimately acknowledged by people’s memories (e.g., the Armenian genocide). Even without that, I do find that the objective reportage leaves out the subjective/personal impacts, which can add a lot of context. So in general I find we need to look at a combination of the two. So I was giving you my subjective interpretation of how it was then. You may choose what to do with that information. At any rate, you can take my comments as reactions to your post and leave it at that. Thanks for the thoughtful reply! I absolutely agree, “official” written history is only half the story. I love it that you, and some of my other commentators, are able to give me a new perspective on these things as people who have access to other sources. If you wouldn’t mind, just so I know where you are coming from, if you could include statements like “as I recall” “my impression is/was” “I feel that” “as someone who was alive then” in your comments, that would help me a lot. That way I know that you are speaking as a witness to that time, and I should treat your statements in that way, rather than trying to counter them with written facts. And, I hope, you will also try to be forgiving and understanding when I say something you disagree with. It’s not necessarily that I haven’t done intensive research and thought a lot about these issues, it is that certain areas are just not accessible to me as someone who is young, and in America, and not fluent in any language besides English. I try very hard not to rush to judgement, to check my facts as best I can, and to keep the context in mind. That’s part of the reason I didn’t even feel comfortable starting a blog until after I had already gotten my Masters and gone through the process of writing a book. I didn’t want to put any writing out there that was only half-considered, or half-researched, or revealed a bias, or ran the risk of offending.